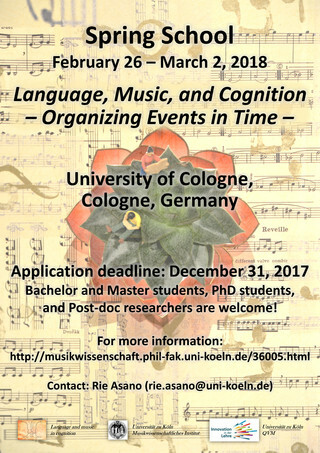 This spring school is one part of our interdisciplinary education program in language and music cognition research called Language and Music in Cognition (http://musikwissenschaft.phil-fak.uni-koeln.de/34666.html?&L=1). In this project, we aim at clarifying interfaces between complex cognitive systems music and language in relation to other cognitive domains such as motor and social cognition. 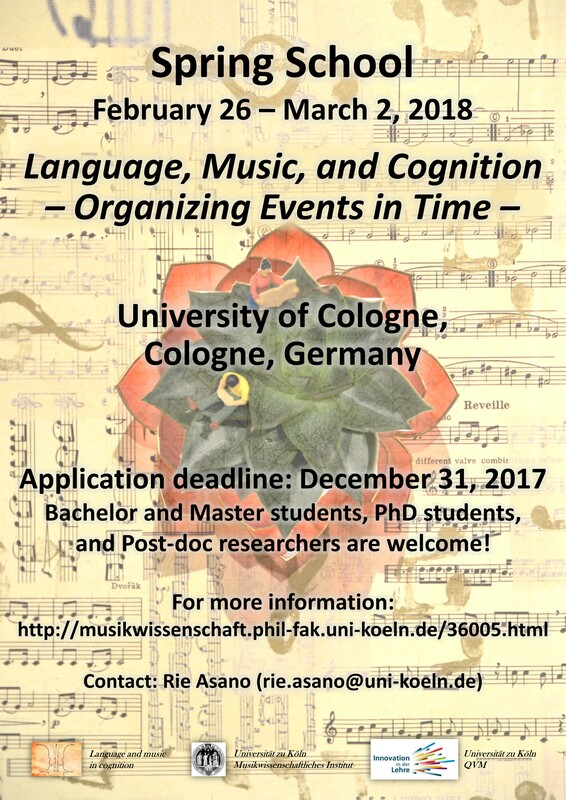 Language and music cognition research involves a wide range of disciplines including musicology, linguistics, psychology, neuroscience, computer science, and biology, and thus requires close collaboration among different research fields. Although language and music cognition research has gained attention recently, there is still little opportunity for students and young researchers to acquire a wide range of knowledge. Therefore, the current Spring School aims at acting as a platform for knowledge transfer and exchange in this relatively new interdisciplinary research area. What are computational, cognitive and neural mechanisms underlying temporal organization? How does the ability of temporal organization develop in ontogeny? How did the mechanisms underlying temporal organization evolve? What is the adaptive significance of temporal organization? These issues are discussed from the perspectives of computer science, cognitive neuroscience, developmental psychology, comparative evolutionary biology, and social cognition. In particular, the current spring schools investigates temporal organization in language, speech, and music by focusing on syntax, prosody (rhythm and pitch), action, parsing, and organization of verbal and nonverbal communication such as turn-taking. Moreover, we extend the scope of our discussion to other species such as non-human primates and birds to explore the biological foundations of temporal organization in a full range. This spring school is financially supported by QVM Innovation in der Lehre and Cologne Summer School.